It was as if I’d been struck by a thunderbolt. Without hesitation, I signed up for the retreat, finding myself explaining to my friends and family that I had “always wanted to swim with dolphins,” even though I had never voiced this suddenly urgent desire before. I felt a magnet pulling me back to Hawaii, where I’d first learned to swim at six (falling off a house boat while the grown-ups were dining below! ), and fell in love with peanut butter (sat on the step outside my Hawaiian home, open jar and spoon, staring off into the woods). Back then, no one talked about dolphins, much less swimming with them in the wild. But something must have been coded into my body and spirit, waiting to be re-ignited years later. The retreat was led by Hannelore Theil, an international speaker, author, teacher and Spiritual Life Coach who has been holding these retreats for over a decade. 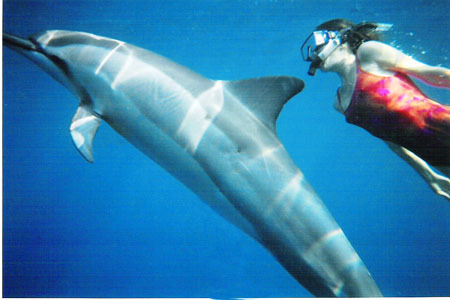 Here’s one of her numerous dolphin stories… enjoy! One day, after swimming with dolphins, our group returned to the shore to rest, dry off and share stories of the morning’s swim. Suddenly a pair of small dogs bounded through our circle to the shore line. One dog was holding an injured back leg tight against his shaking body, pain radiating across his face. His buddy, a healthy, self-assured dog, looked out over the water, then turned to the lame dog and barked. Together they leaped onto a lava formation that protruded out from the shore, holding an intense focus toward the horizon. About five yards from shore there were a few kayakers paddling around the swimmers and dolphins, so I thought the dogs were looking for their owners. As our group continued to watch, fascinated, the dogs looked at each other again. The stronger one barked, and then, simultaneously, they leapt from the lava rock and began swimming. I assumed the dogs were swimming out to their owner in one of the boats. Except, they passed the first kayak, then the next, then next with no acknowledgment between the dogs and the people. The dogs just kept swimming straight ahead. Some in our group were concerned because, at this point, these small dogs were at least a quarter of a mile from shore. Suddenly we saw a cluster of dorsal fins emerge and surround the dogs, and we realized that the dogs had swum out to be with the dolphins! Together the dogs and dolphins swam as a group. With a slight turn they swam parallel to the shore. Then they all circled and turned in unison. This was an odd sight, yet the dogs and the dolphins swam beautifully together. Wherever the dolphins went, the dogs stayed right with them, their little heads bobbing up and down in the middle of the pod as they paddled. About 15 minutes later, the dolphins took a unified breath, dove down and disappeared from view. At the same time, the dogs made a sharp turn and began swimming toward shore. At one point, the dogs caught the same wave and rode it into shore; shook off the excess water from their bodies and with smiles on their faces scampered off through our crowd and began playing in the tide pools. The dog whose leg was injured no longer showed any signs of injury or pain, running on all fours, jumping, splashing and appearing quite joyous. Whatever had been bothering him, clearly no longer was. He was perfectly fine. Everyone in our group laughed as the two dogs jumped up on their hind legs and pushed off each others front paws. Then the two ran off to explore the beach…off to their next adventure. It was perfectly clear to our group that the injured dog was led by his buddy to receive a healing from the dolphins in what is one of many tales showing us great examples of inter-species communication and assistance. What would you like to experience or heal, in 2013, that would enliven you and your art with the magic of the real? Much to my surprise, Hannelore called me last week to say that she had an entire retreat – March 23 – 31, 2013- with 10 spots open. Together, we decided to tailor this retreat specifically for visual artists. And… we are holding a preview call – Tuesday, Feb 5, 2012 to talk about the retreat in detail (with more amazing dolphin stories!). You can sign up for access to the call and the recording, where Hannelore and I will answer all your questions! You can also read more about the only 9 spots left (one was snatched up immediately) for the “Swimming with Dolphins Artist Retreat,” by clicking here.